Bet Bears +5 over Vikings with Karamba. Bet Bears-Vikings over 40.5 with 888Sport. A number of top NFL sportsbooks had the Bears as 100-1 shots in Super Bowl betting before the year started. After locking down the NFC North title two weeks ago, Chicago has a chance Sunday to potentially earn a first-round playoff bye with a win over Minnesota. The Bears will need some help for that scenario in the way of a Rams loss to San Francisco. While the Bears are in, Minnesota will be playing for its playoff life on Sunday. The Vikings hold the second NFC wild-card spot but a loss to Chicago and Philadelphia beating Washington on Sunday eliminates Minnesota from the post-season. The Bears are 8-1 in their last nine games. Minnesota has not played well against good teams this year and have gone 0-5 against teams that have clinched postseason berths. Here’s how fans of NFL betting should approach the game. Although Chicago’s offense only put 14 points on the board against the woeful 49ers a week ago, quarterback Mitchell Trubisky was 25-for-29 for 246 yards with one touchdown, no interceptions and a 113.5 passer rating. He missed only once in a second half that saw Trubisky go 16 for 17, a performance eclipsed only once in team history, when Jay Cutler went 10-for-10 in the second half against Detroit on Dec. 5, 2010. Chicago’s defense again made plays when it was needed. Last week marked the second time in three games that the Bears did not allow a touchdown. Minnesota’s offensive attack should be much more formidable than San Francisco’s. Quarterback Kirk Cousins stared 1-for-3 against Detroit, then completed 20 of his final 25 passes. He totaled 253 yards and three scores for a passer rating of 137.9. Overall, Cousins is putting together an impressive campaign, ranking seventh with 2,685 passing yards, along with being third with a 71.4 percent completion rate and ninth with a 102.2 passer rating. He also has 17 touchdowns passes. Tight end Kyle Rudolph caught nine passes on nine targets including a pair of touchdowns versus Detroit. He along with Adam Thielen and Stefon Diggs give Cousins three potent weapons for Chicago’s secondary to handle. 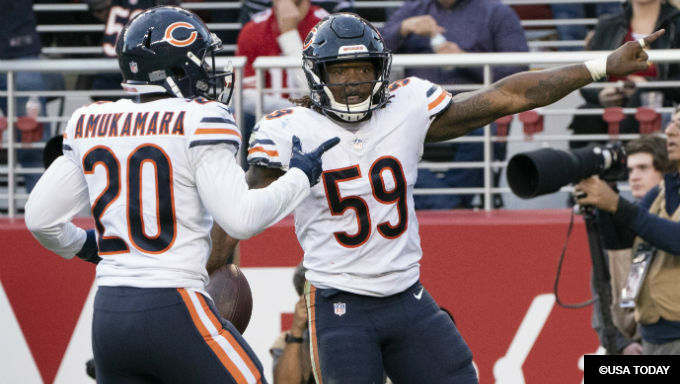 Speaking of the Bears’ secondary, cornerback Eddie Jackson missed last week’s game with a high ankle sprain and remains questionable for Sunday. Chicago is also “cautiously optimistic” that guard Kyle Long could play in Sunday’s regular-season finale returning from a foot injury. Minnesota has a pair of key injured players to nurse back to health in order to make an impact. Linebacker Eric Kendricks missed last week’s game in Detroit with a hamstring injury. Cornerback Xavier Rhodes was forced from last week’s game with a leg injury. Add it all up, and I’d bet Chicago +5 with Karamba. Trubisky has just five touchdown passes on the road in 2018. He has 24 touchdown passes all season. He’ll have to up his road game Sunday in a very hostile environment against a Vikings defense ranked eighth in the NFL. Minnesota will need to diversify its offense some and work running back Dalvin Cook more into the attack after his solid outing of 89 rushing yards on 10 carries against the Lions. Chicago features one of the top defenses in the NFL this season, allowing just 18.9 points per game. Khalil Mack has recorded 12.5 of the Bears’ 45 sacks so far this season. Pressure on Cousins is a key in forcing Minnesota to rely more on the running game that without Cook’s recent contributions has not been impressive. Should Minnesota win, these two teams would play each other in the first round of the playoffs. Could that potentially change both head coach’s playbook with Chicago’s Matt Nagy and Minnesota’s Mike Zimmer holding a thing or two back for a potential rematch next Sunday, which would be the third meeting of these two squads in seven weeks? Take over 40.5 with 888Sport.